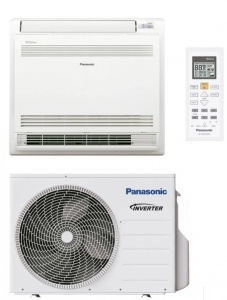 Panasonic CS-E12GFEW Floor Console heat pump and air conditioner comprises the indoor floor console unit with handheld controller and outdoor condenser unit. Rated at 3.5kw output this system can provide reliable heating even during the coldest winter months with air conditioning mode avialable during the summer months. The CS-E12GFEW indoor units has double flow air outlets for even air distribution and at only 600mm in height will fit onto to most low walls.